In a large skillet, brown sausage, breaking apart with fork; remove from heat. 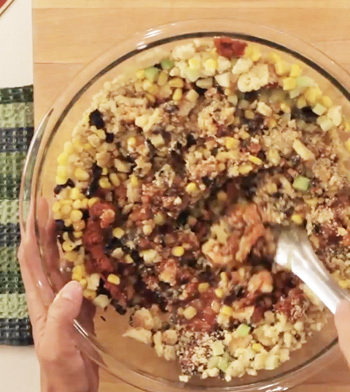 In a large mixing bowl or container add stuffing mix, olives, celery, corn and cooked sausage; mix well; gradually add in butter, salsa and tomato juice to moisten stuffing. Place stuffing in a greased baking dish, and bake on middle rack of preheated 350°F oven for 45 minutes until internal temperature reaches 165°F.